The St. Lawrence Seaway between Montreal and Lake Erie is jointly managed by The St. Lawrence Seaway Management Corporation in Canada and the Saint Lawrence Seaway Development Corp. in the U.S. They operate 15 locks, several short canals, narrow channels, and many vehicular and railway bridges. 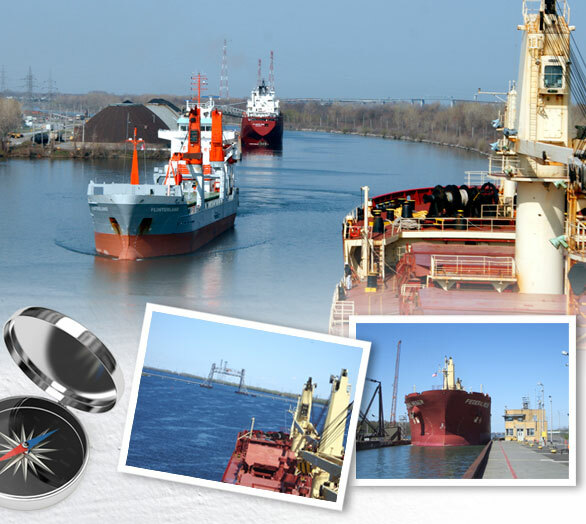 This commercial waterway allows the movement of millions of tons of merchandise and raw materials toward the large industrial centers of the Great Lakes. It is a vital artery for the economies of both Canada and the United States. The operation area of the pilot members of the Corporation starts at St. Lambert Lock, bypasses the Lachine Rapids by way of the South Shore Canal, which is only 100 meters wide up to Côte-Sainte-Catherine Lock. From there, the canal continues past Côte-Sainte-Catherine Wharf, where various cargoes, such as road salt, gypsum, coal, fertilizer and general cargo are transhipped. This part of the canal also passes the Mohawk Indian territory of Kahnawake before reaching Lac St. Louis, a diverse ecosystem of fish and migratory birds, where the St. Lawrence and the Outaouais rivers meet. At the western end of the lake, vessels have to pass through the two Beauharnois Locks. We continue our voyage through the Beauharnois Canal, which funnels water to the turbines of the massive Beauharnois Generating Station. At the west part of the canal, the Port of Valleyfield handles various liquid bulk cargoes, and is a growing transshipment center of general cargo for the Arctic. The Seaway passes through the beautiful Lake St. Francis, an important nesting ground for many species of birds, including the great blue heron. Our passage then winds its way through the Saint Lawrence Islands, past the Akwesasne Mohawk Reserve, the city of Cornwall, and comes to an end at Snell Lock.